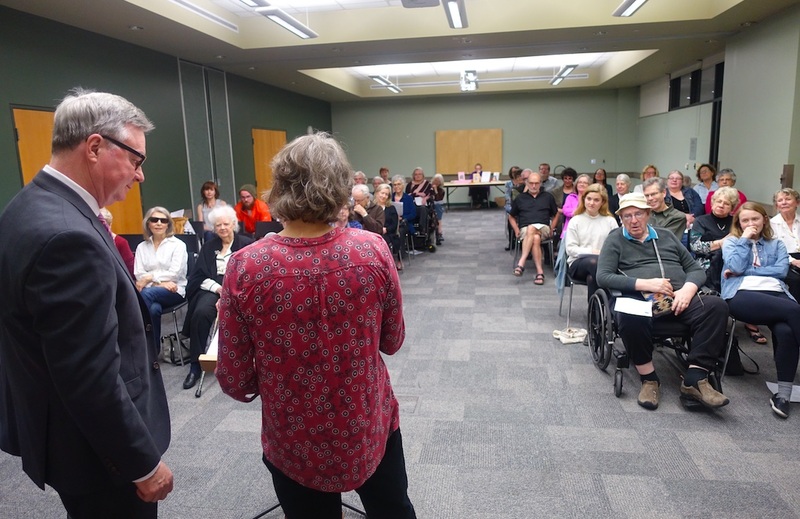 Thank you all for joining us on Monday May 7th at the The London Public Library‘s Stevenson & Hunt Room for “Voicing Colleen” — an evening of poetry by Colleen Thibaudeau. Host Peggy Roffey chose 33 of Thibaudeau’s poems read by a choir of voices — some solo, some shared, some with the audience. 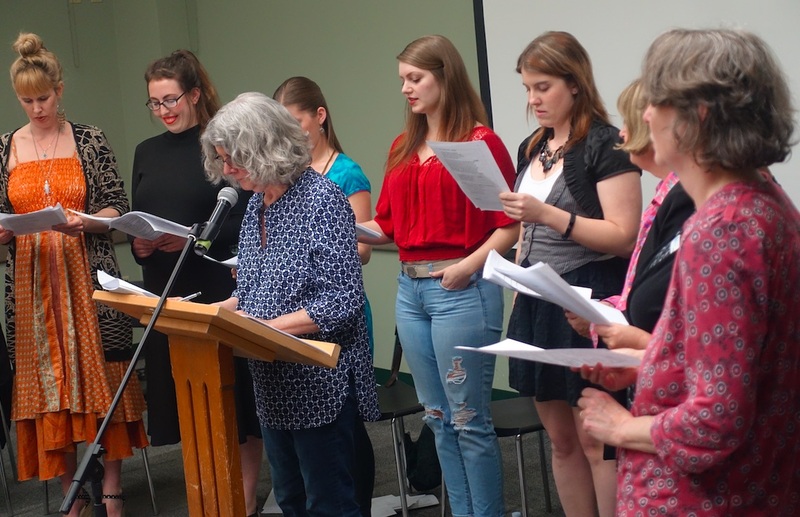 Unique to this evening was the chance to hear the ten poems in Thibaudeau’s elegiac sequence “Ten Letters” read by ten different voices. 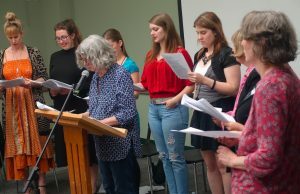 Voicing Colleen: Jean McKay leads on “I do not want only” accompanied by Kelly Creighton, Angie Quick, Kelly McConnell, Koral Scott, Brittany Renaud, Susan Wallace, and Susan Reaney. 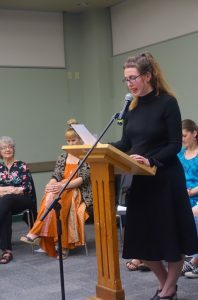 Angie Quick reads Colleen Thibaudeau’s poem “The Rose Family”. Thank you Peggy Roffey for organizing this event and inviting an intergenerational group of readers to voice Colleen’s work — Patricia Black, Kelly Creighton, Carolyn Doyle, Kelly McConnell, Jean McKay, Angie Quick, Brittany Renaud, and Koral Scott, along with members of Colleen Thibaudeau’s family — her son James Stewart Reaney, daughter-in-law Susan Wallace, and daughter Susan Reaney. 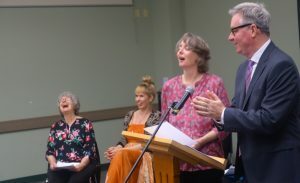 Voicing Colleen: Left to right: Patricia Black and Kelly Creighton enjoy Susan Reaney and James Stewart Reaney reading “Looking at The Artemesia Book”. 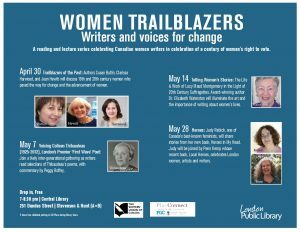 Special thanks to the London Public Library and Carolyn Doyle for including Colleen Thibaudeau in the “Women Trailblazers” series celebrating Canadian women writers. 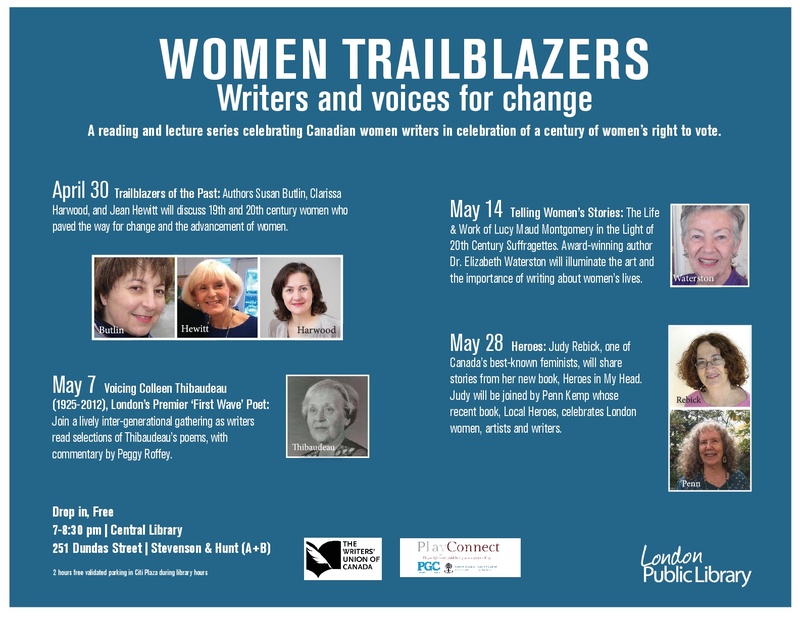 The series concludes on Monday May 28 at 7 pm with Judy Rebick and Penn Kemp reading from their new books. 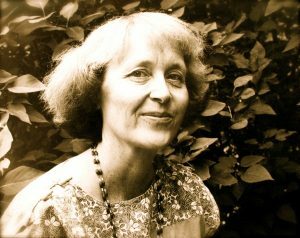 Brick Books has three titles by Colleen Thibaudeau: The Martha Landscapes (1984), Ten Letters (1975), and The Artemesia Book (1991), which are also available in e-book versions.